Jasper National Park is known for some of the greatest sightseeing in all of the Canadian Rockies, so much so, that for a first time visitor, it may be difficult deciding which of the many great sites you’ll want to spend your time at. We’ve complied a short list of some of Jasper’s best sights, but if you need more, surf around our site, ’cause we’ve got plenty of suggestions. 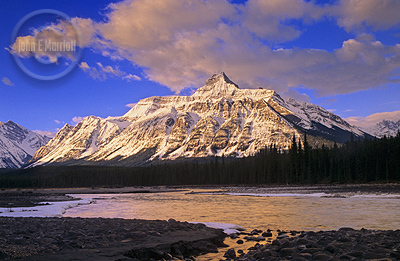 Jasper National Park offers some of the world's most beautiful scenery. Also, if you want to take a good look at Jasper before coming here on your vacation, visit the Jasper WebCam. It’s a free, live camera that you can actually take turns controlling! It gives views of both the townsite and the surrounding park. You’ll find Maligne Lake about 6.6 mi. (1 km.) southeast of Jasper. This is widely considered to be one of the most picturesque gorges in the Rockies, with sheer limestone walls plunging to depths of over 50 metres (165 ft.). There’s also an interpretive trail winding its way from the picnic area over six separate bridges where you can catch the spray from the powerful Maligne River, or peer into the mossy depths. In winter, try your hand at a guided Canyon Tour across the floor of the frozen canyon. Find Lac Beauvert about 4.2 mi. (7 km.) from Jasper. This is the site of one of the Rockies, and perhaps the worlds most beautiful and challenging golf courses, as well as the amazing, world-famous Fairmont Jasper Park Lodge. You’ll find plenty of great vacation activities here, including fine dining, shopping, horseback riding, hiking, mountain biking and boating and plenty more. The fabulous Miette Hot springs are just 60 km. (36 mi.) East of Jasper, offering the hottest natural hot springs in the Canadian Rockies. So hot they have to be cooled from 129 F (54 C) to a reasonable 102º F (39ºC). Miette hot springs are in the scenic Fiddle Valley, the facility includes two hot pools (one pool is wheelchair accessible), a cool pool and poolside cafe. Nearby hiking trails, picnic sites and accommodation make Miette Hot Springs a perfect destination. Swimsuits, towels and lockers available to rent. Both these amazing lakes site about 5 mi. (8 km.) from Jasper. A winding road leads to these two beautiful Rockies lakes where boating, fishing, picnicking and hiking are extremely popular. Rental facilities include horseback riding, canoeing, windsurfing, boating, and sailing. Cross-country skiing and ice-skating on Pyramid Lake in the winter make this an ideal location for family fun. Seasonal and year-round accommodation and dining facilities available. Pyramid Island is now wheelchair accessible. This is one of Jasper’s top tourist attractions, and you’ll find it just about 5 mi. (8 km.) south of Jasper. The Tramway whisks you up Whistler’s Mountain to an elevation of 7496 feet (2285 metres) for amazing views of Jasper National Park that go on and on. Exhibits here explain the high alpine environment and a hiking trail takes you to the summit of the mountain. On a clear day the peak of Mt. Robson can be seen all the way over in British Columbia.